It's the off-season for Celtics guards Marcus Smart and Jaylen Brown, but you would never know it. They know that NBA players raise their skill levels in the summer. If Brad Stevens goes with his backcourt lineup from last season, Jaylen will start at shooting guard and Marcus will come off the bench at both the one or the two. Both of them have been working hard on their games and their fitness. They look ready and anxious to take the court right now. They make for a potent defensive tandem. We are looking at a top-level athlete right here. 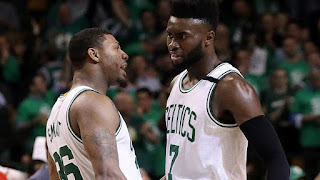 Lebron may be have the best physique in the NBA, but Jaylen just does everything quietly. Marcus had weight problems in the past, but he looks in top shape now. I have always marveled at Jaylen's ripped appearance and his athleticism. Should be a great season.